Nepal's seven-party opposition alliance says it is ending weeks of protests after King Gyanendra agreed to its demands to reinstate parliament. 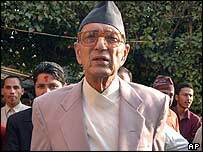 The alliance has chosen former Prime Minister Girija Prasad Koirala to head a new government. The king's announcement follows weeks of unrest by opponents to his absolute rule. At least 14 people have died. However Maoist rebels, behind a 10-year insurgency, rejected the deal and vowed to continue blockading the capital. KP Situala, a spokesman for the opposition alliance, said it had "called off the general strike and protest", and that planned demonstrations would become a victory celebration instead. Thousands of people have been gathering for the rally, waving party and national flags, and shouting slogans against the king from the roofs of vehicles. 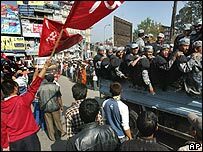 Many told the BBC's Dan Isaacs, on the streets of Kathmandu, that they would not stop demonstrating until King Gyanendra was stripped of his powers. The king assumed direct powers in February 2005 saying parties were unable to deal with Maoist rebels. 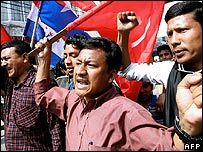 They king's concession was "a new ploy to break the Nepali people and save his autocratic monarchy", said Maoist leader Prachanda in a statement. The BBC's Charles Haviland in Nepal says all eyes are now on the Maoists and what their next move might be. But he says the November agreement could be grounds for optimism that the opposition and the Maoists will work out their differences, and eventually lead to an end to the bloody rebellion. Jubilant Nepalis poured onto the streets to celebrate after King Gyanendra agreed to their demands in a TV address on Monday night. The demonstrators, who repeatedly defied shoot-on-sight curfews despite the deaths of 14 people, chanted: "This is the people's victory! Long live democracy!" In his address, the king expressed his "heartfelt condolences to all those who have lost their lives in the people's movement and wish the injured speedy recovery". The US welcomed the king's announcement and said he should now consider assuming a "ceremonial role" in the country's governance. More than 13,000 people have died in the 10-year Maoist insurgency aimed at replacing the monarchy with a communist republic. Violence has escalated since the rebels ended a truce in January - although they declared a ceasefire in Kathmandu this month as the street protests began.